Miscellaneous | Car lovers can talk for hours about their prize possessions: The sports suspension that allows them to take corners at high speed and how electronics assist in extreme conditions. Regrettably most of the time, tyres are completely overlooked in the prize category. Nonetheless, the tyre is the only real contact between the car and the road, and significantly responsible for road holding, comfort and safety. So, how significant is the influence of car tyres and what type of tyre fits your car best? Especially in winter, the same question is asked over and over again: Which tyres should I buy? When my Cappuccino became especially tail happy, it was time to find a definitive answer to this question. The "quest" led me to the "MyTyres.net" website. This company is a subsidiary of a large German firm and hosts a wealth of information about car tyres. A phone interview with the head German tyre specialist Rainer Binder proved even more insightful: "The influence of car tyres depends very much on the circumstances", Binder explained. "On a dry road at 90 km/h, the influence is marginal, but when circumstances get more demanding so gets the tyre". So, that is why it is of the utmost importance to select the perfect tyre for each situation. The properties of a tyre can be roughly defined by the following three factors: Profile, material, and construction. These factors mutually influence each other. 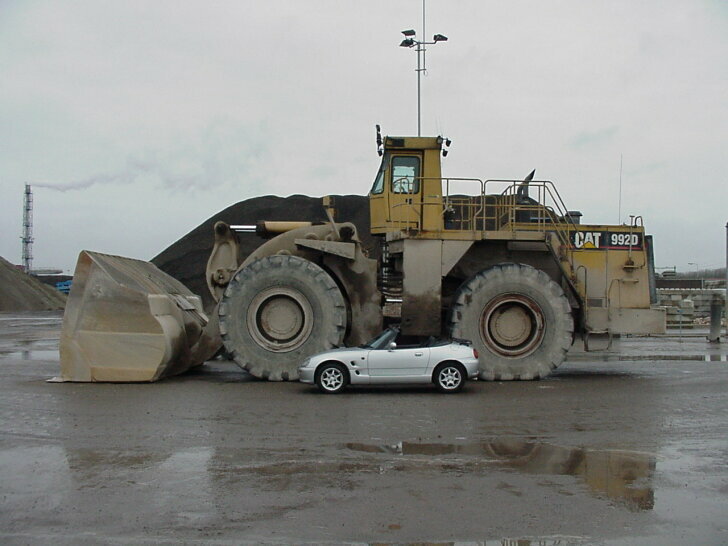 For example, one can create a tyre with exceptionally good grip, but this means a very short life expectancy. Only in car racing are such extremes useful, while for normal road cars, a certain mixture is chosen. An average car will be confronted with all sorts of weather and so an all rounder is more useful in this context compared to getting a tyre type that only excels in one field. When buying tyres, one should emphasize those of the above-mentioned factors that matter, and choose, for example, a product that offers minimal noise, good load capacity or perhaps lower fuel consumption. To make a concrete choice based on numbers, the German website at MyTyres provides owners' reviews for each tyre type. If one prefers to take less of a risk, it is safest to stay as closely as possible to the specifications of the original factory-fit tyre. In case of the Cappuccino, that is the Bridgestone Potenza. While developing a car, manufacturers of car and tyre work closely together thereby choosing a tyre before even producing the car. Especially in case of special cars, it is wise not to deviate from the tyre choice of the manufacturer or at least to consult a specialist before changing tyre type. Those reading between the lines will conclude that every situation demands a special tyre. Weather conditions play an important role in affecting tyre performance and therefore special summer and winter tyre types exist for specific season demands. Summer tyres have excellent grip, can handle high heat and last long. However, this tyre will perform poorly at temperatures below 7 degrees Celsius. For cold weather driving conditions, it is not only wise to get special winter tyres, but may also be mandatory in that insurance companies in some countries oblige the driver to do so. The profile of a winter tyre is adapted to handle large amounts of snow and water and has better road holding at low temperatures. Formerly, this also meant less comfort and lower top speeds, but recent technical developments have resolved such problems. Although it may be tempting to believe that winter tyres are suitable to use all year, this is not advisable. With heat, the capacities of winter tyres are reduced significantly, resulting in physical damage in extreme cases. An in-between solution is the so called "all-season" tyre. This tyre type combines the best average properties of both a summer and winter tyres, but will never excel in cold winters or warm summers as a weather-specific tyre would. Still, considering safety at a budget, the all-season tyre is worth considering. In most cases, the moment to buy new tyres is determined by the profile depth on the tyres currently in use. When only the front or rear tyres need replacement, it is best to fit the new tyres on the powered wheels (in the case of the Cappuccino, these would be the rear wheels). The best pair of the remaining tyres can be fitted on the other axle. It is not advisable, and in many cases not even legal, to mix different makes and types of tyres on one axle or even on one car. One should consult the owner's manual for model-specific recommendations. When choosing a tyre type, the first step is to determine the size of the tyre needed (size relative to the size of the rim), and type (minimum strength, maximum speed). 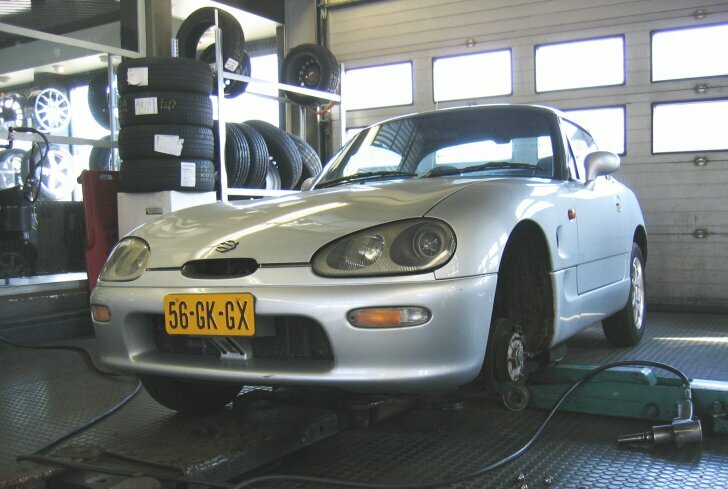 After clicking the "Advice" button at the MyTyres.net site, the factory sizes of the Suzuki Cappuccino are shown. Also, a list of suitable tyres for a given size appears. Now, one can use the factors mentioned above to find the ideal mix. In the case of the Cappuccino, it is important to transfer the tremendous power to the road in a safe way, especially in the rain. For grip and rain, the profile is the most important factor, so that only two tyre types now remain to be further considered. These have a special V-shaped profile which promises to handle rain at its best. MyTyres.net vouches to offer the best possible prices, because it is an international company that saves money by dealing in extreme quantities. According to Rainer Binder's advice, Marshal tyres are remarkably good value for money, while Michelin tyres on offer provide somewhat more security. Your car tyres are the only real connection between your car and road. Therefore, the right choice of tyre type is of paramount importance. It is especially in extreme weather conditions, such as low temperatures, or in panic situations, that the influence or a car tyre can be enormous. The difference between one tyre type and another is mainly explained by durability, grip, road holding, comfort, and fuel consumption. To be safe, one can choose the same tyre type as the manufacturer of the car did. On the influence of tyre properties, ask a tyre specialist for advice and choose the ideal mix of properties. Bear in mind that not all shops have the same assortment of tyre types and will only offer what is in stock. Therefore, look around, because it matters in making the right choice and getting the right price.